Kreatio systems are architected to improve performance while optimizing costs. There are four elements of architecture that define how well a content management system performs. These are the information architecture, the system architecture, how it enables information discovery and the technology stack used. All Kreatio platforms follow a similar architecture. Here we describe the architecture of our Content Management System (CMS). Unlike competing systems, Kreatio platforms are architected and built ground up to handle multiple publications and users for a publisher. Thus, our information architecture starts with the Publisher. It assumes that a Publisher will have multiple publications and that each publication will have multiple internal users with differing roles. The information architecture of Kreatio systems take into account the fact that people may work individually or together in teams and will need to share their work across the organization, and sometimes outside, to clients. Our information architecture also accounts for different publications from the same publisher having completely different, and even opposing content categorization and presentation rules. Finally, our information architecture takes into account the fact that a writer could be working for multiple publications and may need to post the same content across publications, without being penalized by search engines. Teams, projects, roles and access rights are all built into Kreatio platforms to ensure smooth collaboration within the organization. Kreatio systems follow a four tier architecture. Each of the tiers are individually scalable on requirement and thus, you can optimize the resources deployed from a cost perspective. At the bottom of the stack is the database. Above the database resides the Kreatio CMS. The CMS has all the business rules for accessing and managing the data. The data is accessed through the Kreatio API services layer and is presented to your readers using the Web Publishing Layer. By isolating the layers, we are able to ensure optimum performance across the system. In addition, we can scale each of these layers independently, thus ensuring that system costs are always optimized and unnecessary cloud resources are not deployed. If you choose to be deployed on Amazon, you could also autoscale the Web Presentation System part of the stack, to scale up and down with traffic. Enabling Information discovery is an important function that any publishing system has to perform. This discovery has to be enabled both in the front end for readers, as well as in the back end for content creators and marketers. Kreatio platforms are architected to enable information discovery across the board. Some, like the directory having the capability to have equivalences. An item can be declared to be equivalent to another and then, search for the first will also throw up the second. Systems like ChitraAI implement Artificial Intelligence and machine learning to enable fast search, without needing human entered tags. Intelligent search and deep search, both work across the system. A user, while searching, need not specify which field to search in. The system makes intelligent assumptions on where to search and displays results accordingly. Kreatio platforms are built using a combination of best of breed technologies to provide the best performance at the optimum price points. We mix and match commercially available as well as custom developed technologies including AI and machine learning algorithms and APIs in creating of our platforms. 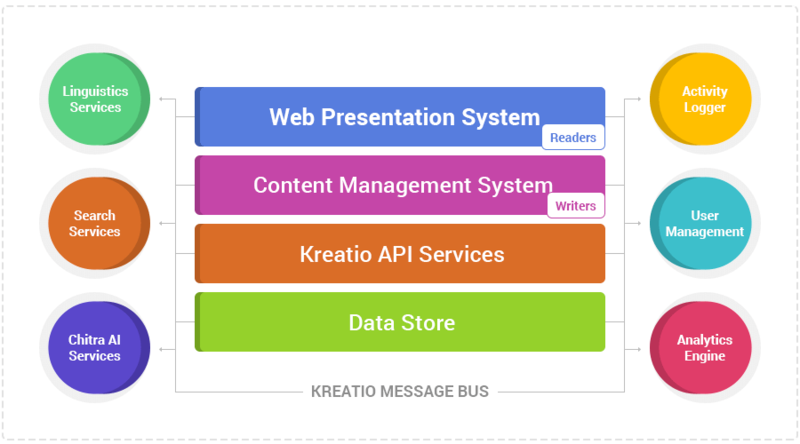 Kreatio platforms are built to enable higher productivity across editorial and marketing teams and to improve monetization of content for todays digital publishers. This is enabled by thoughtful architecture at all levels.